Karen Lirenman is a grade 1 teacher in Surrybridge, Canada – so this is her first international presentation! She is the only 1:1 classroom in her district. As much as she loves being 1:1, much of what she does, could still happen with far less devices. In the beginning of the year, Karen’s class started with 1 tweet: This is what it looks like outside of our classroom. What does it look like outside of yours? AND, the world responded. What was interesting about using Twitter, is that the little grade 1s realized that the world is far bigger than their small environment. Twitter is a way to connect to authors – such as Amy Dyckman. The class tweeted to her, and she wrote every child back. It’s amazing how it connected her class to real people who have done things and written things to inspire. They use hashtags a lot, but you have to make sure to check and make sure that it isn’t already being used. They should be safe and no one should be using them. For example, the students use #mathstory or #2d3dshapes. The students then get tweets back that answer questions in a variety of ways. Anything that Karen says she could have taught her students, Twitter taught them 2 or 3 times over. In addition to using Twitter for math, they also use it for literacy. For example, they did #santasec13 for Santa’s secrets as a way of developing voice. 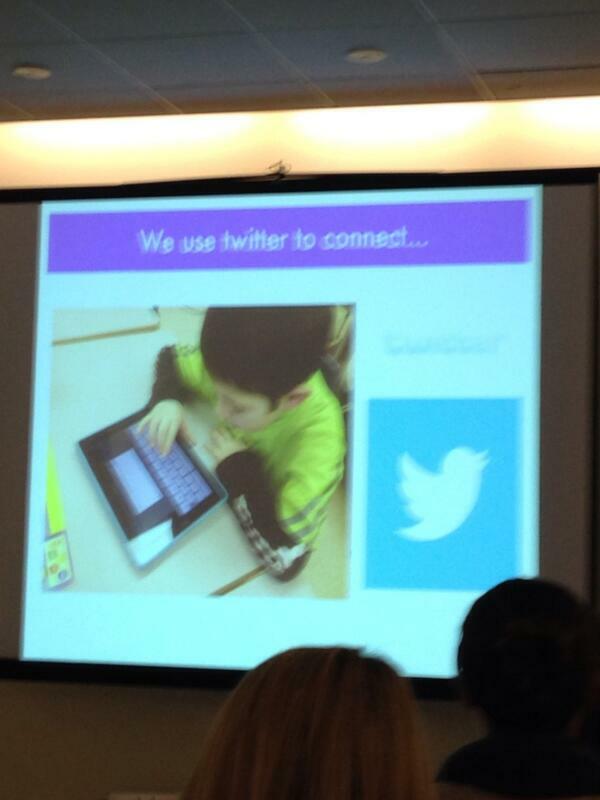 They have created hashtags during a live presentation as a way to backchannel with other children. When twitter is blocked, they use TodaysMeet. While it’s not private, it is pretty difficult to find the room without a link. They have shared predictions on stories, math, literacy, etc. It’s not quite the same as Twitter, but it’s a great way to connect. In Karen’s class, each student has their own blog which they use for connecting. Her video explains a lot about how she uses blogs with and for her students. They use it to connect with others by sharing their learning. It also sparks conversations with students around the world through blog comments. It was a simple way for students to connect and have conversations. This year, students are also categorizing all of the work that they post to their Kidblogs as a way to showcase their work. Given the asynchronous nature of technology, they can connect with students around the world on their timezones. Given the technology, students aren’t just engaging during school. They are going home and continuing the conversation – making it real and authentic. Beyond connecting with students through blogs, they also connect with authors and share ideas. Karen showed a video of a news story about her class connecting with others via Skype. Her students have Skyped with other schools in Canada as well as the US and Switzerland. As a class, they connect for a variety of different reasons. They did a project about “what do you see in your schoolyard” which allowed them to understand geography and climate. Currently, they are working on “Mystery Number Skype” to practice math. Another option is to read a story and make predictions together. Karen’s class also took part in Global Read Aloud. An unintended consequence is that the students are starting to get a greater understanding of timezones. Another benefit is learning through experts and sharing learning. By having others come into the class exposes them to a variety of new contexts, people, and ideas. There are pretty powerful connections being made as the students are empowered to talk to others. Skype can also be used for 1 on 1 connections. Students may Skype individually with other students in order to teach and learn from each other. One on one reading is another great use of Skype. Sometimes, it allows students to read with parents or experts who can’t come in for community reading time. In one project, the students co-created within the class using Book Creator. Karen showed an example of a Book Creator project about animals. First, the students created their own books, and then they combined books in order to collaborate and manipulate the content. Another option is to connect with older students using buddies. In another example, they co-created Pic Collages where students could connect curriculum. It allowed the younger students to gain more than anticipated and the older students solidified their understanding. They even co-created with a high school. Karen’s students identified what they wanted stories to be about, and then the high school students wrote texts based on the notes. When it came back, the elementary students illustrated the text. The final stories were converted into videos with the student narration. To wrap it up, the high school drama class performed the stories as plays. All of this emanated from a single tweet that Karen put out about looking for classes to connect with storytelling. When asked, Karen says that all of the connecting does not really pull from the time of the day. It doesn’t add much beyond what she would otherwise do. In the beginning, they did a lot of connecting as a class. As the year has progressed, the students have taken more ownership of it. It’s not an add-on, it works into the background of the class as authentic reading, writing, listening, and speaking. “What’s really nice is that connecting creates meaningful work.” Karen says. The students want to read and want to write because they have real, authentic connections. It’s a powerful way to learn, and you can do it across any curriculum. When asked about the technicalities of blogging with students, Karen says to remember that it’s about progressing from guided to independence. What then happens is that the students start teaching each other as they learn something new. Another option is to do new tools and apps with “big buddies” so that they can learn from each other. Karen also has her students co-creating with other classes in other parts of the world. They used Skype to connect with a class in Iowa to create new books based on what they all ready during Global Read Aloud. Each student did their own page, but then they compiled all of the pages from Book Creator to make their own versions of The Very Hungry Student based off of The Very Hungry Caterpillar. In another project, the students co-created a “Good News Bad News” story. Each set of classes started with illustrations and then wrote the stories for each others’ books. Karen’s class also participates in structured global connection/collaboration projects such as DotDay and QuadBlogging. As much as they connect on a global level, Karen also connects within the local community both by bringing parents and family into the classroom for reading as well as via Skype for those who cannot come into class. The big point is that the more you are willing to connect, then the more opportunities present themselves for you and your students. Karen has a lot more information in her session handout.